A complete renovation and restoration of the property was completed in March 2009, turning this disused former dockworkers hotel in one of Newcastle's rapidly developing harbour side suburbs, into a beautiful and modern guest house with its own, very popular, wine tapas bar / pizzeria / modern restaurant. Owner and Chef, Scott Webster, offers patrons the benefit of his 40 years experience working in and owning some of the best restaurants in the world. A stone's throw from the harbour with its new yacht club, the local fishing fleet and Fisherman's Co-op, Carrington Place offers guests high quality guest house style accommodation and a special food and wine experience, all at reasonable prices and close to the harbour, inner city and beaches. House guests also have access to a private lounge area with tea and coffee making facilities, large screen television, newspapers and magazines. Note The majority of rooms do not have en-suite bathrooms but have access to high quality shared bathrooms. Superior Queen room on our first floor with 2 x queen beds. Shared bathroom facilities. Queen room on first floor with view over either Young Street or Dining Room courtyard. Shared bathroom facilities. Superior Queen room on ground floor with ensuite/disabled bathroom. Twin room overlooking either Young Street or Dining Room courtyard. Shared Bathroom facilities. Carrington Place can also cater for business functions and meetings. Our guesthouse office is open until 6pm daily, for arrivals after this time please call the guesthouse for check in procedure. NOTE We do not accept check ins after 10.00pm. Limited parking is avalable on site for guest's vehicles. Newcastle is the gateway to the Hunter and while the world famous Hunter Vineyards are just 40minutes easy drive away, there is plenty to see and do closer to Carrington Place. Newcastle is famous for its beaches, with several of the famous surf breaks just a few minutes drive from Carrington. 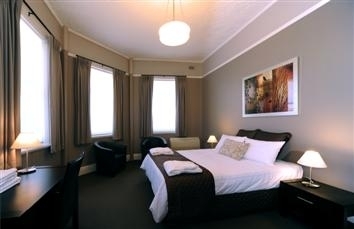 Guests can also experience the "new" Newcastle within walking distance of Carrington. The rebirth of the city over recent years has seen a vibrant new cafe culture develop, with many exciting eateries and bars dotted along the harbour shoreline. Start at the Newcastle Cruising Yacht Club, just 200 metres from your front door and wander through the Honeysuckle, Boardwalk and Queens Wharf precincts to Newcastle Beach or take a short detour down the Darby Street for a tour of Australia's largest regional art gallery and your choice to dine from a long list of bars and cafes. The Hamilton food and entetainment precinct is just a five minute drive from your accommodation and offers a food slection stretching from fine French Bistro to Italian, Indian, Asian, Greek and Thai to name a few. 40 minutes North of Carrington PLace you will find the wonders of Port Stephens, one of Australia's most beautiful waterways. Go whale or Dolphin watching, quad biking on the "too big to believe" sandhills on Nine Mile Beach or just kick back and enjoy the areas sensational seafood with some of the Hunter's equally famous wines.